Engagement on Facebook is down over 22% since the beginning of 2017. Your audience may be tuning out. This isn’t anything new, happens all the time, especially with a vehicle that reaches the masses gets hit by 30 Billion pieces of content every month. The problem for businesses is that Facebook has become the source for site traffic. Nothing fuels online commerce like traffic! Let’s face it, social media has surpassed search engines as the top method to reach a large relevant audience. Without traffic the online e-commerce platform cannot survive. Content marketing is a great marketing tactic to increase search rankings and time-on-page but it will not attract the needed traffic by itself. Complex and well thought out conversion funnels cannot gain enough data to support the facts it needs to make quality decisions without traffic. SEO has become so competitive that for the average small business it cannot supplant the rankings of others without traffic to the optimized pages. What drives the traffic to social media? Paid advertising! Speaking of traffic: What social media vehicle has the greatest impact on traffic? Facebook now has over 2.01 billion monthly active users. Instagram has 700 million monthly active users. Twitter has 328 million monthly active users. LinkedIn has 112.5 million monthly active users. Visual content is 40 times more likely to be shared on social media than any other type of content. Facebook status updates with images get 2.3 times more engagement than Facebook status updates without images. People are 80 percent more likely to read content that has colored visuals. Infographics are 3 times more likely to be liked and shared compared to any other type of content on social media. ~ Hosting Facts Ltd.
How does an organization keep its Facebook engagement rate up? Get social and reply to all comments with a human being. If you want your followers to engage with your Facebook posts, your organization needs to engage with them. People are social beings, Facebook is just a digital tool for people to talk to each other and ask questions that get instant answers from their favorite brands. Your audience wants to be heard! If they are heard they will keep coming back. There’s a psychological explanation for this, too. We suggest you go a step further and reply in the comments on your organization’s page with your first name. This adds a personal touch to your replies. This makes the commenter feel like they are in-touch beyond the brand and the brand’s post. How does an organization create engaging content for Facebook? One of the most iconic brands to ever master any form of marketing is Coca-Cola. Jonathan Mildenhall, former Vice-President, Global Advertising Strategy and former CMO at AirBnB explains how to generate engaging content. Jonathan describes the challenge of content creation in an enlightening way, reminding us that “every contact point with a customer should tell an emotional story”. Your organization’s content that is shared on social media should appeal to your audience’s basic needs which your organization has a product or service that it resolves. Every possible connection made with your organization’s audience should be expressed through a story that speaks to their needs, wants and desires. This belief should resonate with the staff that comments on your social media posts as well. In Coca-Cola content 2020, Jonathan describes content as that which has substance, matters to the audience not just the brand, is significant to their life, creates a conversation and ultimately creates brand engagement. Ask questions and try to avoid statements unless those support some set of facts within a post. People love to talk about themselves and not be talked down to. Add infographics and images that people would want to save or share. Images are engaged with more than double that of text alone. 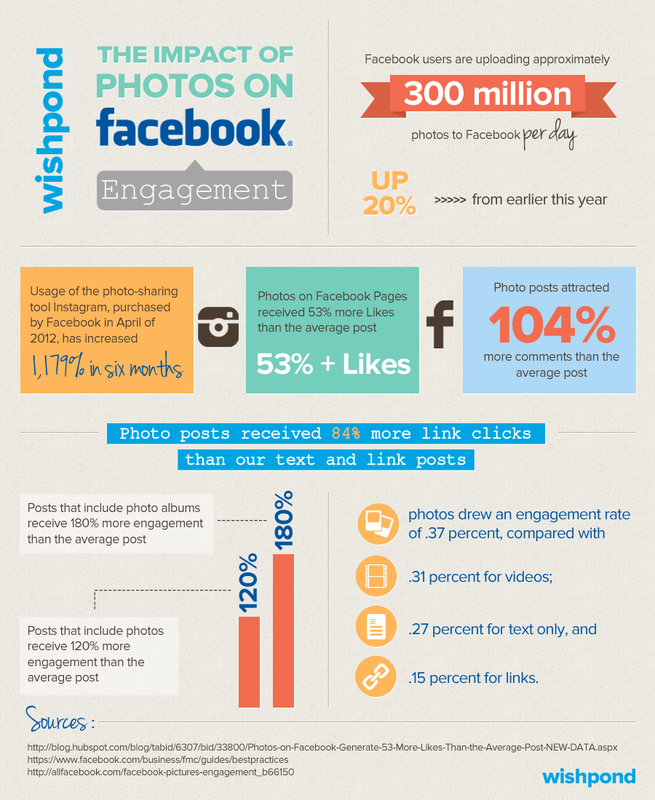 According to this Wishpond infographic, photos receive 53% more likes and 104% more comments than the average post (some research suggests these numbers may be even higher). Do not be afraid to be controversial. Your organization has to take a stand and carve out its niche’. You have to be careful not to alienate your fans, however referencing content that deals with a ‘hot button’ or controversial topic will rally your audience to defend your organization and remain a vocal advocate. Ask for opinions from your audience whenever you are having an internal discussion about your products, services, values or even the effectiveness of your marketing. Show your fans you care about their opinions by asking for feedback. Get personal and come out from behind your faceless brand. People love to engage with a brand that has a face behind the name. They especially love it when that face gets personal. Consider sharing your personal photos, trips, vacations or hobbies. Perhaps Facebook organic engagement is down because content publishers have forgotten how to be social using social media because they are pushed to convert those likes into sales. Get social! Yes your organization needs to educate its audience. Yes your organization needs to be viewed as an authority. However, that does not mean it can’t be social, respectful and human.